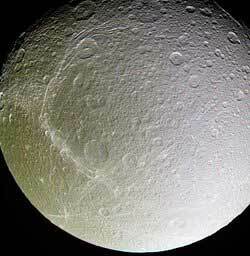 Dione (dye-oe'-nee, Greek Διώνη) is a moon of Saturn discovered by Giovanni Cassini in 1684. 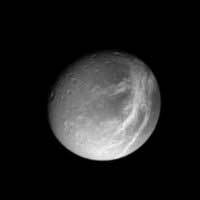 It is named after the titan Dione of Greek mythology. It is also designated Saturn IV. Cassini named the four moons he discovered (Tethys, Dione, Rhea and Iapetus) Lodicea Sidera ("the stars of Louis") to honour king Louis XIV. Astronomers fell into the habit of referring to them and Titan as Saturn I through Saturn V. Once Mimas and Enceladus were discovered, in 1789, the numbering scheme was extended to Saturn VII. Dione is composed primarily of water ice, but as the densest of Saturn's moons (aside from Titan, whose density is increased by gravitational compression) it must have a considerable fraction of denser material like silicate rock in its interior. Until the Cassini probe flyby of December 13, 2004, the origin of the bright wispy material was obscure, in part because the only photographs of it had been taken from a great distance. All that was known was that the material has a high albedo and is thin enough that it does not obscure the surface features underneath. One theory was that shortly after its formation Dione was geologically active, and some process such as ice volcanism resurfaced much of its surface, with the streaks forming from eruptions along cracks in Dione's surface that fell back to the surface as snow or ash. Later, after the internal activity and resurfacing ceased, cratering continued primarily on the leading hemisphere and wiped out the streak patterns there. 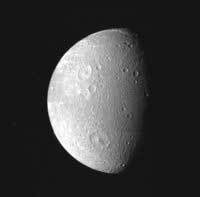 However, the latest images from Cassini show that this theory is incorrect, and that the wisps are in fact not ice deposits at all, but rather the bright ice cliffs created by tectonic fractures; Dione has been revealed as a world riven by enormous fractures on its trailing hemisphere. 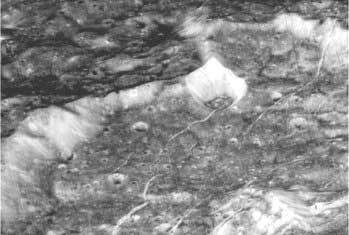 The Cassini orbiter performed a closer flyby of Dione (500 km) on October 11, 2005, and captured oblique images of the cliffs, showing that some of them are several kilometres high.